In the newly released box art for Codemasters’ upcoming casual racer, F1 All-Stars, a mysterious driver has appeared. Just who is she? 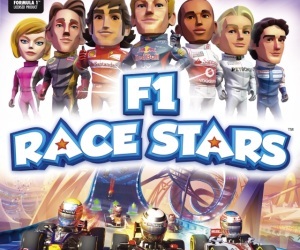 For Codemaster’s upcoming F1-licensed take on the popular kart racing genre, F1 All-Stars, there has been a lot of excitement about racing around fantasy versions of famous tracks such as Spa and Monaco as highly stylized versions of the current Formula 1 roster, but the box-art for the upcoming PC, PS3 and 360 hit has raised some interesting questions. Alongside the usual big names, like Sebastian Vettel, Lewis Hamilton and Fernando Alonso, there’s a mystery pink-suited driver as well. It seems likely she ties into the game’s extensive career mode that will see you race against your favourite drivers as you’ve never seen them before. Whether she’ll be available in the local or online multiplayer modes is as yet unknown. Details are currently scarce on who exactly this mysterious woman is. Whoever she is, I guess we’ll have to wait for the release of the game on Xbox 360, Playstation 3 and PC in November to find out. Until then, the beautiful box arts are available below.